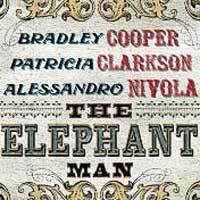 The producers of The Elephant Man are pleased to congratulate Bradley Cooper on his Academy Award nominations for Best Actor and, as a producer, Best Picture for the film American Sniper. To allow Mr. Cooper to attend the award ceremony in Los Angeles on Sunday, February 22, The Elephant Man will now play its final Broadway performance on Saturday, February 21 at 8 pm. The performances on Saturday, February 7 at 8 pm and Sunday, February 8 at 3 pm are also cancelled to allow Mr. Cooper to attend the 67th Annual DGA Awards in Los Angeles where he will be presenting to American Sniper director Clint Eastwood. The Elephant Man is currently playing at Broadway's Booth Theatre (222 West 45th Street, NYC). Ticket holders for the cancelled performances should contact their point-of-sale to exchange their tickets for a performance before the end of the run. Based on the real life of Joseph Merrick, The Elephant Man tells the story of a 19th-century British man (Cooper) who became a star of the traveling freak show circuit. When the renowned Dr. Treves (Nivola) takes Merrick under his care, he is astonished by the man's brilliant intelligence, unshakable faith and, most of all, his resounding desire for love and understanding. He introduces Merrick to the beautiful actress Mrs. Kendal (Clarkson), who is deeply touched by this pure and genuine soul. As a complex friendship blossoms among the three, Treves and Kendal struggle to protect Merrick from a world of questionable intentions... and so begins a story of love as unique as "The Elephant Man" himself.